The rapidly spreading Thomas Fire in Ventura County has burned more than 115,000 acres and is only 5 percent contained, as of Friday morning, according to Cal Fire. 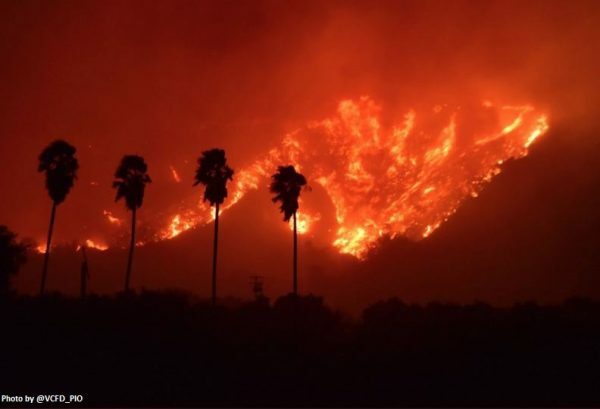 Meanwhile, several fires have broken out across Southern California. At about 6:28 p.m. Monday, the Thomas Fire ignited north of Santa Paula near highways 150 and 126. It burned about 45,000 acres over night, then doubled in sized the following day. Pushed by Santa Ana winds, the fire has spread northwest of Ventura, reached Highway 101 and come close to Santa Barbara County. Fire officials say one woman was found dead inside her car in an area near Ojai that was burned. The car was reportedly found at the scene of an accident. The cause of her death has not yet been released. As of Friday morning, the Thomas Fire has destroyed 427 structures. Numerous evacuations orders remain in effect. The fire continues to move toward Santa Barbara. Mandatory evacuation orders are in place for parts of Carpinteria near Highway 192, north of Highway 150. In Los Angeles County, there are multiple fires burning, including the Skirball Fire, which has burned 475 acres near the 405 Freeway and Sepulveda Boulevard. Expensive homes in the area have already been burned.